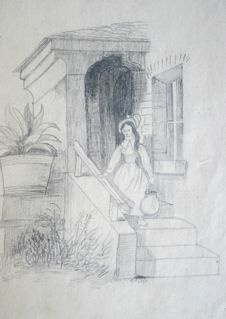 Lydia attended school in the large upstairs room at Old Derby that we know today as the “ballroom.” The room was divided in two, with girls in the southeast half and boys in the northwest half. Up to 30 North Parish girls, age 9 or over, could attend the Academy. 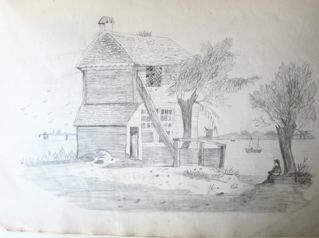 As a Hingham resident, Lydia’s minimal tuition included supplying her share of firewood during winter for the one stove in the room. Girls were taught writing, English, French, arithmetic, geography, and needlework, a traditional skill for schoolgirls who demonstrated their proficiency by embroidering samplers. Our prior post featured examples of Lydia’s penmanship exercises and maps; if any of her needlework survives, it did not come to us. 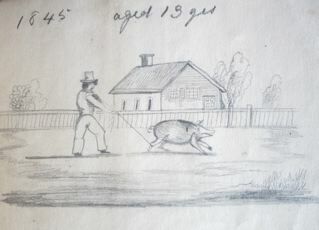 Drawing was also a desirable skill for young ladies and one at which Lydia Sprague clearly excelled. 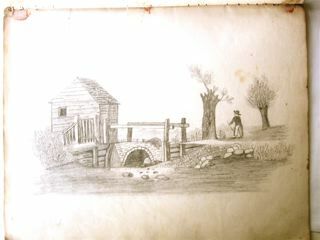 Her sketchbooks date from 1844 through 1846, beginning when she was 12 years old. 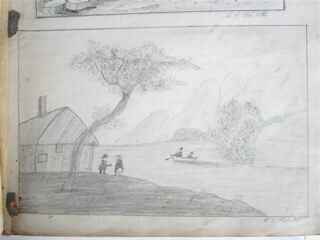 They contain numerous landscape vignettes with figures and cottages, charming and detailed and derivative of engraved illustrations she may have seen in local gazettes, copies of European paintings or popular Currier and Ives prints. 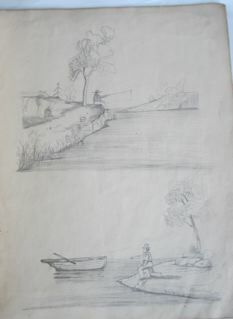 Copying such images was a common way for a motivated student to develop drawing skills. –but others appear to have been influenced by direct observation. Many landscapes include a bay-shaped expanse of water that suggests Hingham Harbor. 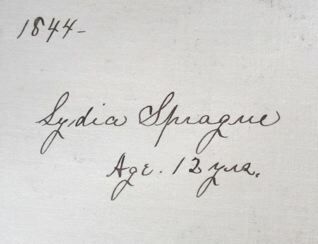 Other than her school work and drawings, we know little about Lydia Sprague’s life. She grew up in Hingham Center, married young, and had no children. In all likelihood, she set aside her artistic ambitions when the demands of married life shifted her priorities. 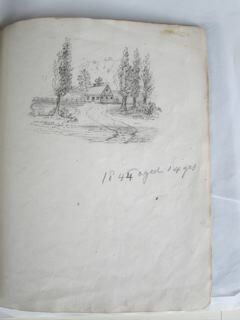 Similarly, the story of her sketchbooks before they came into the Society’s collection is also a mystery. Lydia’s survive today in very good condition, perhaps treasured and protected for decades by a doting niece or nephew before finding their way into our collection. This entry was posted in Uncategorized and tagged art, children, Derby Academy, education, women.